What’s the Least Amount of Running You Need to Do to Be Healthy? You’ve seen those people who wake up early, pep already in their step, to go for a five-mile run before work. They’re successful, generally happy, and take care of their bodies, because they know they could eventually die of a heart attack if they don’t. You are not one of those people! We feel your pain. It’s the pain of knowing you really should be running (or doing something semi-active), but not wanting to spend much time or effort on it. So we set out to find the least amount of running required to boost your chances of living a long, healthy life. It’s true: The Copenhagen City Heart Study found that people who jogged at a moderate pace for 1 to 2.4 hours per week had a lower mortality rate than sedentary non-joggers and strenuous joggers, though the study did not look at cause of death. So that's it? A moderate jog for an hour a week is all we have to do to extend our lives? Could cardiovascular fitness really be that simple? There’s conflicting information out there from all the authorities, making our task even more difficult. The American College of Sports Medicine recommends moderate-intensity cardiorespiratory exercise for at least 30 minutes, five days a week. The National Institutes of Health complicates things a bit, saying that any exercise is better than none (duh), but for major health benefits, do at least 150 minutes of moderate-intensity aerobic exercise per week. The NIH also says that 75 minutes of vigorous aerobic work per week is just as good. 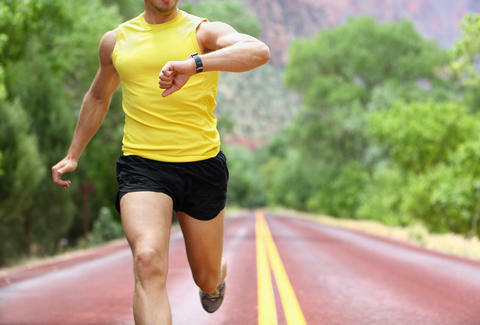 No matter how high your intensity, your workouts should last 10 minutes at a time, and be spread over multiple days. If that’s too much to keep track of, Dr. Matthew Budoff, a cardiologist and professor of medicine at UCLA, recommends 20 to 45 minutes of moderate exercise per day. “Remember, the heart is a muscle,” Budoff said in an interview, “and we want to strengthen that muscle.” To do so, you don't have to log hours doing speed work or pound pavement for extended periods of time -- even a brisk walk makes your heart stronger. If your goal is to lose weight or look good at the beach, it'll take more than the occasional 20-minute walk, but you don't have to be out training for a marathon. In fact, overtraining puts you at risk of arrhythmia, orthopedic injuries and coronary artery calcified plaque, a known indicator of coronary artery disease. Sometimes, laziness can lead to efficiency. Instead of thinking about the minimum effort required, aim for great results with a minimal time investment. Strength and conditioning coach Jeff Richter suggests interval training -- quick bursts of hard work followed by a recovery period. He says interval training can help those who are less likely to be enthusiastic about an hour-long run, but still want to be active. Interval training can start at any level. The idea is that you really push yourself during the intense intervals which you shouldn’t be able to sustain for more than about 30 seconds at a time. During the recovery periods, drop to a pace that would allow you to have a conversation. While Dr. Budoff finds high-intensity training effective and a good way to vary routines, he advised consulting a doctor before starting, particularly if you're unsure of your heart's health. Good news! The minimum amount of running you need to stay healthy might just be… none. Dr. Hussain said that while the Copenhagen study looked at runners specifically, it wouldn't be too much of a stretch to extrapolate to other activities. So if you don't want to run, don't. Bike, swim, skateboard -- just get your heart rate up, for at least 20 minutes on average each day. If you stick to that 20-minute rule, you should be (relatively) fine, and don’t feel guilty if you’re not banging out 10-milers a few times each week. The NIH sums it all up with a pretty basic recommendation: “The more active you are, the more you will benefit.” Thanks for that, NIH! Candace Nelson is a freelance writer and one of those crazy people who gets up at 5am to go running. Read more at candacenelson.net.